All options, including the military one, are on the table when it comes to dealing with Iran's nuclear program, an Israeli Cabinet minister said Saturday, after discussing the issue with senior U.S. officials. 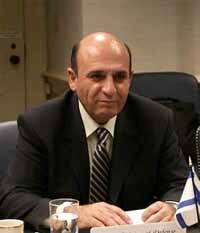 For now, sanctions are the best way to go, said the Cabinet minister, Shaul Mofaz. He said Israel and the U.S. agreed to review the effectiveness of sanctions at the end of 2007. "The strategy shared by the U.S. and Israel has three elements," Mofaz told Israel Radio. "One is a united international front against the Iranian nuclear program. Secondly, at this time, sanctions are the best way to act against the aspirations of Iran." He said the third element is "a very, very clear signal and a clear statement that all options are on the table." Mofaz added: "I never said there is no military option, and the military option is included in all the options that are on the table, but at this time it's right to use the path of sanctions, and to intensify them."